Cahir Park B team played Peake Villa B in the semi final of The Peter O Reilly Cup and unfortunately were on the wrong side of a 4 0 defeat. Well done to our u14 girls who travelled to Killenaule Sunday morning and played in freezing conditions. This was a tough game from the start. Cahir girls went one up but Killenaule came back to level again. Cahir relaxed on the ball for a little while but got going again to sneak ahead 2-1, and were lucky to hold them to that with Emma Maher pulling off exceptional saves. Killenaule were unlucky not to score again before the final whistle. A great game of soccer on a bitter cold morning. Well done girls. The u16 girls made history playing on the New All weather pitch for the first time under lights. Thanks to Peake Villa for travelling on the night and for a great first game. Both teams have had a big gap in games but made up for it when they gave it everything, enjoying the big occasion and the fabulous new pitch. Cahir are thrilled to take the win tonight in what was a brilliant display by everyone with the final result 5-1. Well done to Shannon with her hat trick, and Ellie and Leah sharing the spoils. 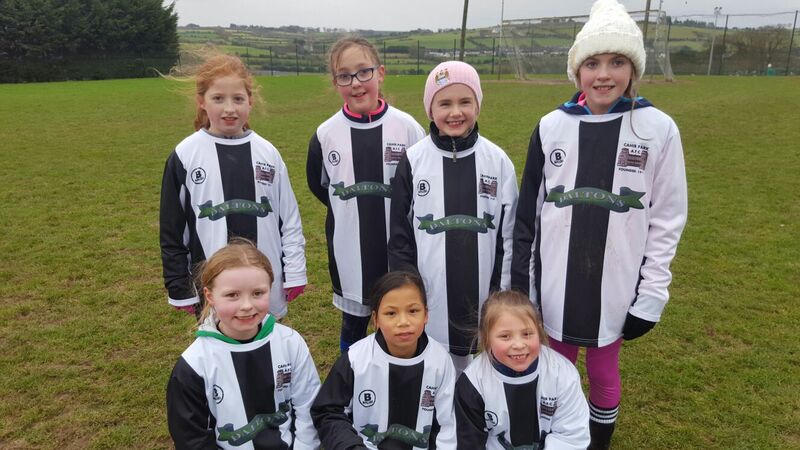 Our U 9 girls travelled to Killenaule also on Sunday in what was though weather conditions but they had a brilliant day playing 3 matches and played great football. Thanks to all the parents for travelling to the game. We had great action when we hosted an Under 8 Blitz held Sunday at Cahir Park Astro Pitch where we hosted Clerihan and Clonmel Celtic. It was fantastic to see the lads getting to play football even though the weather was poor and all teams gave great entertainment and showed they are really enjoying there football.Well done to all. Cahir Park will be putting in a gear order with O Neills on Monday February 27th. Anyone who wishes to order gear please fill out order form and return to the office with payment before Friday February 24th. Contact office on 052 7443850 for more info. We have a winner.Congratulations to Shane McGrath last man standing winner of €1,000 thanks to the great Joe allens winner for stoke city against Crystal Palace . Hard luck to Eddie Costello runner up who picked Sunderland and were beaten 4-0 by Southampton. Thanks to all who supported fundraiser. Pints are on Mac .